I've seen discussions around this for years. Why do giant pumpkins sometimes go heavy and why do they sometimes go light relative to their estimated measurements? The simple answer is that there is no simple answers to that question. But there is good evidence that there are different factors that come into play. Let me say from the outset, that my conclusions here are not scientific, but they are based on real data and more than a decade of growing giant pumpkins. In my experience and from soil samples from many growers across the country, there are three mail factors that contribute to where a pumpkin goes light or heavy. These are in no particular order: genetics, environment and fertilization. Let's first talk about genetics. There does seem to be a genetic factor that influences if a pumpkin goes heavy or light. In my earliest days of growing, the 898 Knauss was known to produce off spring that tended to go heavy to the charts. A good example of that is the 901 Hunt and its offspring. The 901 was 19% heavy and of its 27 progeny, only three went light with the average pumpkin going an amazing 10% heavy and some going as much as 27% heavy. That is statistically significant. The numbers say that only 50% of those 27 pumpkins should have gone heavy, but in this case 88% went heavy and they went a lot heavy on average. That tells us something. Genetics plays a factor if a pumpkin is going to go heavy or light. For this one, I have good data, but I'm not 100% sure if there is one main factor. I'm pretty sure it is going to be temperature, but humidity could be a factor as well. I've grown in two states with similar environments. Warm/hot days with cool nights and a somewhat shorter growing season. Years ago I noticed a pattern that was different than most of the Orange Belt states where the biggest pumpkins are grown. In Colorado and Utah the vast majority of pumpkins end up going light on the scale. Particularly in years that are very hot weights tend to be down and pumpkins tend to go light. I've seen years in Colorado where the vast majority of pumpkins went light. For example, in 2012, which was a hot summer, only six of 31 pumpkins went heavy. This year in Utah, out of 31 pumpkins that went to the scale at Thanksgiving point, only 4 pumpkins went heavy and it was a hot summer this year in Utah as well. Different growers using different growing practices and a wide variety of seeds, so really only the weather can account for how only 12% of the pumpkins went heavy when statistically 50% of the pumpkins should have gone heavy to the charts. 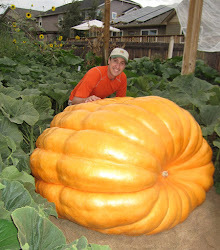 One thing that immediately stood out to me when Beni Meier had his amazing world record year was how all of his pumpkins were world record size and all of them were well over the charts. When I learned how he was using a meter to help determine how much fertilizer was in the soil, I realized that most growers were under fertilizing including myself, because I couldn't think of another way to account for how high over the charts his pumpkins were. It could be genetics, but he pretty much grew the same type of genetics for all of the pumpkins and he on average was heavier than even the biggest of pumpkins from the same seed. This last summer Ralf Laub did an interesting experiment that he shared with me the data on. He took soil and pH readings on different growers patches across the country as he toured around. Some of these growers had one ton+ pumpkins. The TDS (total dissolved solids) numbers were all across the board for the growers in the sample, but the number that seemed to have a pattern for is if your TDS was under 350 then you were going to go light on the scales. There were growers who had a TDS of over 1,000 and had pumpkins that went light. There were many growers who had one pumpkin go light and one pumpkin go heavy and assuming the the TDS stayed consistent through the growing season and the care and the health of the plants were the same, then you have to assume that something other than fertilization was a factor. But common sense says that if a plant is under fertilized then it cannot meet its full potential and if the TDS is below 350, then a pumpkin most likely is going to go light. Not enough data here to have a solid conclusion on fertilization role in going heavy or light, but there is enough to say there is a role. I've had pumpkins go 18% heavy and I've had pumpkins go 18% light. Both were a real surprise and both plants grew on the same spot. It can be a real kick in the teeth when they go that light, but the scale doesn't lie. I think there are some things a grower can do to help control the factors that determine if a pumpkin will go light or heavy, but it is not completely controllable. At least not without considerable investment. But if a grower understands those factors they may be a little less surprised come the weigh-off.